The remains of the bridge today. 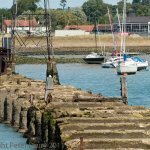 The concrete piers on which the wooden viaduct was built can be seen here. The metal structure to the left of this image is all that remains of the southern pier of the swing bridge.